Mr Dalli has undoubtedly found his position untenable not because he has faced "continuous attack from the Labour Party" throughout the 19 years in which he has served in Nationalist Governments, but because he faced attacks from "different quarters", presumably his own side - whether this be from within the Cabinet, the Nationalist Party, or other sources is unclear. In the meantime the DOI started distributing copies of Mr Dallis letter of resignation and his reasons for doing so. This was a particularly damning document in which Mr Dalli made it clear he was resigning not because he was being attacked by the Labour Party but because he was being attacked from other sides as well. On Bondiplus last week Mr Dalli had claimed he was being made the scapegoat for the PNs election defeat. This time he blamed PBS journalist Ivan Camilleri and The Times for his downfall. I cannot function in these circumstances, he said. It does not take a Dr Sant to point out the inevitable. Dr Sant was simply voicing what the ordinary man in the street would be voicing. On Tuesday, Dalli told me on Bondiplus that he did not exclude the possibility that this whole business was a PN-concocted plot to remove him from office. In no uncertain terms, the former Foreign Affairs minister drew a link between the PN's poor showing at the European election polls and the PN's instinct for finding and crucifying appropriate scapegoats. He was not, emphasised Dalli, about to allow a repeat performance of the post-1996 debacle finger-pointing in his direction. The same goes for the Prime Minister. He too ought to explain why he allowed the matter to drag on for weeks with the public only being told that information was being collated and that a decision would be made "soon". Now it turns out that the decision was taken by Mr Dalli. Or was it? On a government level, the resignation could be interpreted as an acceptable conclusion. But what about the Nationalist Party? Will it take lying down Mr Dalli's public statement that he did not rule out a PN "frame-up" against him? Former Finance and Foreign Affairs Minister John Dalli has called upon individuals within the Nationalist Party he forms part of to come clean and remove the shadow cast over his integrity after the court found no irregularities in the allocation of a hospital tender. This was the only reason why I was forced to resign, Mr Dalli claimed yesterday, adding that he now expected Prime Minister Lawrence Gonzi to take the necessary action. I only got to know about the report on August 15 when a journalist called me to say that Joseph Zahra had been arraigned, thus proving that it (the report) was false. I have no idea why a report which implicated a high profile person like myself was deliberately kept from me. Did someone really think I would tamper with the evidence? Mr Dalli said he was aware of the sources of the plot to tarnish his name  members of my own party - but he would not reveal the names for the time being or whether they were high-profile officials. When I have reason to speak out I will. But I have no intention of keeping things under wraps and I will ask for the necessary investigations. I don't think it's the time to do it (reveal their names). When I do, I will call a press conference. The report was intended to harm my integrity, and let's not forget it was drawn up during the election run up for the Nationalist Party leadership, he added. More than half the respondents in an online survey conducted by The Times were not satisfied with the outcome of the John Dalli case. A total of 1,184 readers participated in the poll - 530 voters, or 44.76 per cent, replied they were satisfied with the outcome of the case and 654, or 55.24 per cent, said they were not. The Labour Party received information about the business links John Dallis family had with an Iranian shipping company from the PNs central office, MaltaToday has discovered. The revelation adds fuel to the allegations made by the former Foreign minister that he was framed by his own Party. In all this, the Prime Minister does not emerge unscathed. On the contrary, we believe that the issue was handled very badly. his (John Dalli) resignation did the PN no favours. Whether in fact he did anything wrong will be decided elsewhere. But the Prime Minister's loss of his Foreign Affairs Minister within a few months of taking office was not good news at all, and seriously undermined the whole Cabinet. His resignation was a very serious dent in the credibility of the government. The unorthodox way of Mr Dalli's resignation, its strange acceptance without any explanation or justification and more so the very immediate appointment of a junior colleague to replace him, defy all the unwritten laws and conventions of any civilised and democratic Cabinet government. it was necessary that, later on, public opinion was educated on this matter and of Castille's flagrant faux pas. John Dalli jikxef il-livell fqir li fih waqa' l-Partit Nazzjonalista. If forgiving those who trespass against us is a heroic virtue in our Christian faith, the owning up to one's mistakes is equally important. Harmony is based on these reciprocal acts. Last Thursday, the court gave its decision in the case of the pseudo-investigator who concocted a report about sleaze in the granting of the contract for medical equipment of Mater Dei Hospital. It sentenced Joe Zahra to two years in prison and five years' interdiction (that is, prohibition from exercising certain rights, such voting in elections) after finding him guilty of all seven charges brought against him. These included the drawing up of a report which could have caused public disorder and which was a calumny against a person in high office. I was that person. The effect of this report was that the Prime Minister and his advisers presumed me guilty and pushed for my resignation from Cabinet even though the report itself was flawed. In his sentence, the magistrate quoted the following verbatim from Zahra's report: During these last week of investigations I had been lessoning (listening) to recording and pickup trails of money. All documentation and recordings came (can) be provided. Some, with legal acts. Others, as I had explained before, they will have to be bought. No such corroboration was given (even that which did not need to be bought). Why did the Prime Minister not insist that he is given this corroboration before taking his political decision? Why was I not made aware of this report and given the opportunity to defend myself? 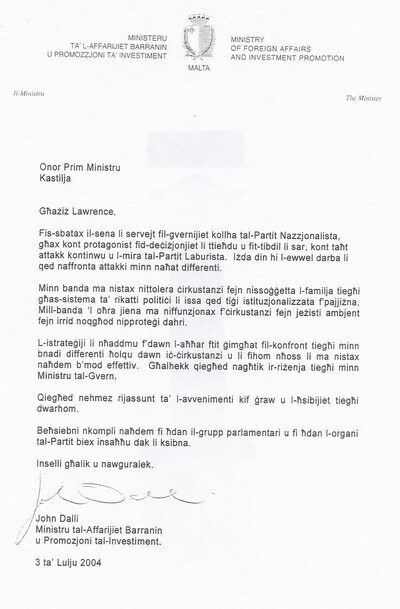 The Prime Minister testified that he was handed this report on June 11, 2004, two full weeks before I tendered my resignation for the following reasons (translated from the Maltese original): In the 17 years I have served in all Nationalist governments, because I was a protagonist in all decisions that were taken and in all the changes that were made, I was under constant attack from the Labour Opposition. But this is the first time that I am facing attacks from a different direction. (On the one hand I cannot tolerate a situation where I subject my family to a system of political blackmail that is now being institutionalised in our country. On the other hand I cannot function in situations where I need to keep protecting my back. The strategies woven in the past few weeks in my regard from different sides created an environment in which I cannot work effectively. Therefore I am tendering my resignation from your Cabinet.) At that time I did not know of the existence of this report. Had I known, it would have explained the irrational, senseless and absurd events that were taking place. And the outcome would have been totally different. This case has had grave political consequences for the country and irreparable personal consequences for me. The mishandling of this report tarnished my reputation: my most valuable possession, which once tarnished can never be fully restored. I have the right and the duty to insist on finding out whether Zahra was acting alone or whether he was pushed by some invisible hand/s. The people must know if there were any other accomplices in the political, commercial and media sectors. Who stood to gain from my political assassination? Who stood to gain commercially from a change of the contract award? These questions need an answer. I am not after vendettas, but I feel I must ensure that the whole truth is made known in the interest of justice and in reparation for the grievous damage caused to me, my family and my country. The fact is that all of us make mistakes. To err is human. Studies about human behavior show that most people think it is a sign of weakness to show that they are fallible and human. They don't see that their own feigned perfection fosters an environment of pretence and fear. They wear a mask that hides the inadequacies they're so afraid of. They are afraid of being exposed. The mark of a man of steel is that he owns up to his mistakes and tries to rectify them. If the mistakes are genuine, owning up is not that difficult. I would like to thank Police Commissioner John Rizzo whose capable handling of the investigation made short shrift of the fraud. I would also like to thank the many who showed their solidarity with me during the past turbulent times and who through short messages, phone calls and e-mail showed their satisfaction at the outcome and encouraged me to keep fighting on. I did not know of the existence of the Zahra report which was in Dr Gonzi's hands weeks before my forced resignation. (M) Spin, with what goal? (T) To create a diversion from the real fact, which was that the person behind this spin had Joe Zahra's report in hand. (M) Are you referring to the Prime Minister? (M) And the Prime Minister had nothing to do with this? (T) Only the Prime Minister knows what he had to do with it, but Alan Camilleri can answer these things, as can Mr Mallia, who used to work with Mr Camilleri back then... The idea given to people back then was that my children were shareholders in the company. Even though they didn't say that, that's what people understood. The Nationalist Party spin has been that the prison sentence imposed on Joe Zahra, the private investigator found guilty of concocting a story about the medical equipment at Mater Dei Hospital, vindicates John Dalli and disproves the campaign waged against him by Alfred Sant. Well, hardly. As John Dalli sees it, it establishes the truth and exposes the whispered lies that undermined his PN leadership campaign. Speaking to The Malta Independent on Sunday yesterday from abroad, Mr Dalli said nobody in the party had contacted him after the court sentence was passed. Its as if they know nothing at all, he said. I was the target of those lies, he said, and the only way in which certain people could acquire power. There was a definite plan and a smokescreen as well. The plan had been put together as far back as January 2004, before anyone knew Eddie Fenech Adami was going to resign and a leadership battle would ensue. 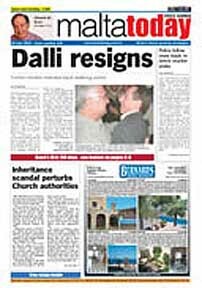 Former minister John Dalli was led to believe he was under investigation by Prime Minister Lawrence Gonzi in his last days as minister, prompting him to submit his resignation even though he was kept in the dark about any investigations in his regard. 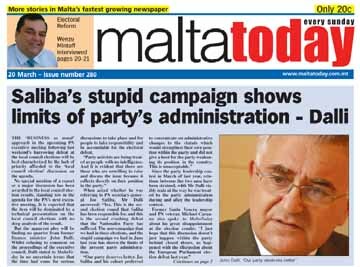 The explosive revelation came yesterday from Dalli himself who in a telephone interview with MaltaToday hit back at Gonzi for declaring that the fabricated Joe Zahra report had nothing to do with his resignation in July 2004. One thing I can say at this stage is that when the Prime Minister spoke to me a few days before my resignation, he had told me that he couldnt have a minister in his Cabinet under investigation, Dalli said yesterday. When I asked him what investigation he was referring to he remained staring at me in the face (baqa jhares iccassat lejja). He never told me what he was referring to. The decision by Prime Minister Lawrence Gonzi to appoint former Cabinet Minister John Dalli as his consultant on matters connected with the economy, competitiveness and negotiations does not close an unfortunate chapter in Dr Gonzi's Premiership and in his leadership of the Nationalist Party. On the contrary, it opens a new one which is likely to still be unfinished by the time the country goes to the polls. Unless, that is, all cards are laid on the table by then which is, however, unlikely, given the damage that could be caused to the PN. Answers, as our sister paper The Sunday Times, noted yesterday, must be forthcoming. The official statements made so far are at best confusing. Let it be said at the outset: This has nothing to do with Mr Dalli himself. 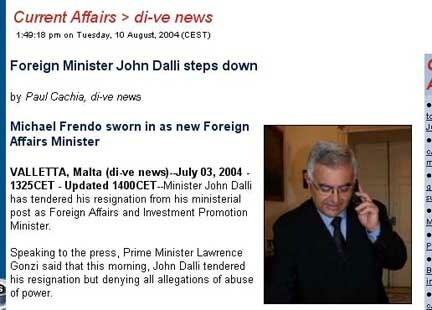 Just two days after his resignation from Foreign Minister at the beginning of July 2004, The Times had editorially commented that Mr Dalli had been "one of the more valid members of any government in post-Independence <?xml:namespace prefix = st1 ns = "urn:schemas-microsoft-com:office:smarttags" />Malta. He possessed both the will and the courage to take decisions that, albeit unpopular, served the country well in the long run. He did not mind announcing what made him look bad in the eyes of the people, including fervent supporters of the Nationalist Party". There is nothing to indicate that he has lost any of his competencies, skills and courage. However, the moment the Prime Minister accepted his resignation three years ago, Mr Dalli's relationship with the government and with the PN, and also the role he could play in both, became a sore point. Mainly, because one would like to think that a Prime Minister does not take lightly to such decisions and so Dr Gonzi must have pondered deeply and looked minutely into the reports/documents in his possession before opting to let Mr Dalli go. It ought to be borne in mind too that Mr Dalli stepped down barely five months after Dr Gonzi had beaten him to the leadership of the PN, succeeding Eddie Fenech Adami. This was another reason why Dr Gonzi would have exercised extra care when handling the matter. So what has happened? Why did Dr Gonzi decide - whether it was a decision he made on his own or through consultation is really immaterial at this stage - to bring back Mr Dalli now, a few months from a general election and when the Auditor General has yet to publish the report the Prime Minister says cleared Mr Dalli from an alleged wrongdoing that had been pivotal in his resignation? The people expect a more thorough explanation than they have been given so far. Perhaps, it would not be amiss for Dr Gonzi to make a statement in Parliament this evening. That would offer the opposition to make its own queries about the whole matter. If everything is above board the Prime Minister should have no problem doing so. There is one other point that needs clarification: The infamous false report about allegations of corruption in a contract for Mater Dei Hospital equipment. Mr Dalli repeatedly insisted that was the real reason why he had been forced to go. Dr Gonzi said it was not. Yet, the day after he is appointed consultant to the Prime Minister, Mr Dalli files a judicial protest raising the matter once again. There must be some significance in that. The Prime Minister has a lot of explaining to do and time is not in his favour.